Taunton Deane is located in Somerset the south west of England. 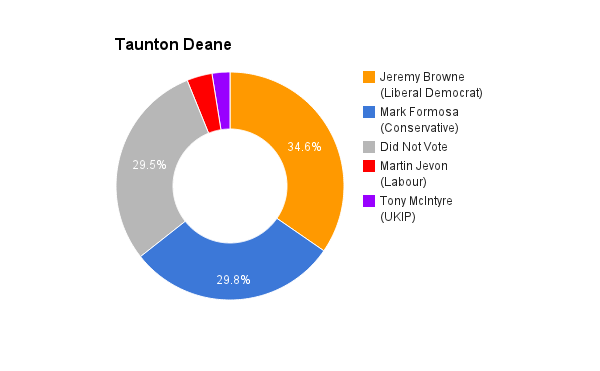 It was created from the previous constituency Taunton, in 2010. The current member of parliament is the Liberal Democrat Jeremy Browne, who has served since 2010. I am 59 years old, married with 2 adult sons, and work for a small software company that specialises in welfare benefit calculation tools. I have lived in the constituency for 18 years. I was a governor of the local primary school for 10 years, 6 of those as Chair of governors. I am an active supporter of local cricket and football teams, a member of Quantock Eco and involved in the life of my local community. For the last 3 years, as Convener, I have tried to build a more active and effective local Green Party. 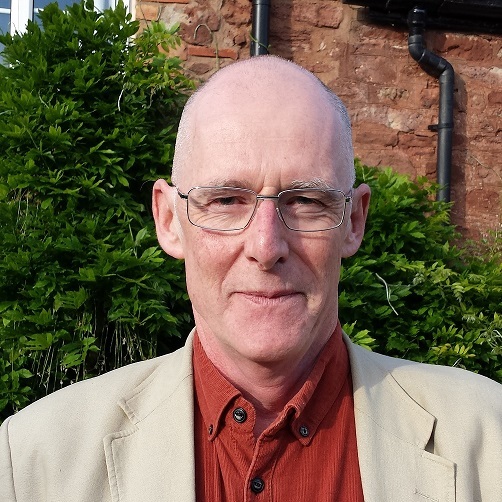 In the 2011 Borough Council elections, I stood in Bishops Lydeard and gained a credible 563 votes. I was also elected to the Parish Council. I stood in the 2013 County Council elections and acted as a spokesperson for the various Green Parties across Somerset. I have campaigned for a cycle path from Bishops Lydeard/Cotford to Taunton, am trying to get the Parish Council to initiate a 20mph speed limit in the residential areas of the parish, and been active on energy issues such as the energy audit of all houses in the village. The Green Party opposes cuts in services and the ongoing privatisation of social provision, and supports taking the railways back under public control. We oppose Hinkley C and support renewable energy. Unlike other parties we do not believe in demonising immigrants, the sick or the unemployed. If in these right-wing times that is a “hard left” agenda, so be it, but those seem eminently sensible, indeed vote-winning, propositions to me. I am trying my hardest to run a high-profile, long-term campaign. The Green Party will be running candidates at every level of the electoral system, building in the long-term to become a significant player in national politics, whilst also being active campaigners between elections. If elected I will run regular surgeries in the constituency and seek to actively raise the concerns of all my constituents whatever their political affiliation. I will provide complete transparency in relation to my expenses as an MP. I will report regularly to my constituents, on paper and via social media. I am standing as the Green Party candidate, and it is only the Green Party that has the policies that will safeguard the environment for our successors and also create a fairer society. I believe that he has been quite a diligent constituency MP. Austerity has been a massive success. Without austerity, would this government have been able to privatize the NHS, triple tuition fees and impoverish benefit claimants? But austerity is a funny thing – the money does seem to be there to cut taxes on business and those earning over £150,000 per year, or for ridiculous vanity projects like High Speed Rail, Trident, or the ludicrously expensive electricity which will be provided by the new Hinkley Point nuclear power station. The Coalition has overseen a continuing drop in living standards for most of us, has failed to reduce the deficit, has slashed and burnt social provision – but heck, house prices have risen in London and the South East and billionaires are even wealthier than they were, so most newspapers will say they are doing a good job. Britain is now a multi-cultural society and I have no problem with that. I appreciate the contribution immigrants make and have made to our society. However, the free movement of labour, like the free movement of capital, are pillars of the neo-liberal policies of our main parties, so I am ambivalent about them. Migration is a function of inequality, people migrate from Africa to Southern Europe, from Poland and Bulgaria to Britain. What we need is a more equal world, where people are able to make good lives from themselves in their countries of origin. Only be electing those who will stand against the interests of the 1% who own over 50% of the wealth – but control 70% of the Press and seem able to frame political debate in a way which serves their own interests. Compared to other countries, the NHS provides an excellent service at a low cost per head, as the recent Commonwealth Fund report shows. Healthcare costs two and a half times as much per head in the USA but is much worse. So this government, and their New Labour predecessor, think the best way to improve things is to get private sector healthcare providers, most of them based in the USA, to run ever larger parts of the NHS, for profit not as a public service. It is insane but it is true. All we need to do is keep the NHS public and provide a modest increase in funding in real terms. We work the longest hours in Europe but have a stubbornly high rate of unemployment. Neo-liberal governments have no intention of bringing in full employment – they like to have a large pool of unemployed people as it depresses wages and weakens trades unions. We should be providing all citizens with a basic Citizens Income which would provide enough security to make part-time work and reduced working hours possible. The Green Party has organisational structures in place to increase the representation of women and has done a good job on that issue. We are looking to do more to involve people from black and minority ethnic backgrounds in prominent positions. But why not have a Cabinet made up of Old Etonians who went Oxbridge? After all, they intend to govern in the interests of Old Etonians who went to Oxbridge. Even if we had a Parliament that was more representative of women and ethnic minorities, the bottom line is what their policies are, what they do, not their gender, colour or educational background. I would encourage them to vote to stay in Europe, but in an EU that was more representative of the needs of European citizens and less representative of big business and the self-perpetuating bureaucracy that seems to have acquired excessive power in the current EU structure.